The body of Bob Bielarz, guitarist for the Chicago, Illinois nu-metal band NO ONE, was identified earlier today (Monday, June 23) after it was recovered from the Calumet-Saganashkee Channel following a crash between a 19-foot boat and a 66-foot commercial towing vessel. He was 39 years old. Bielarz's body was recovered about 10 a.m. Monday in the Cal-Sag, about 11/2 miles west of the Worth boat launch, Illinois Department of Natural Resources spokesman Chris Young said at 1:45 p.m. Monday. 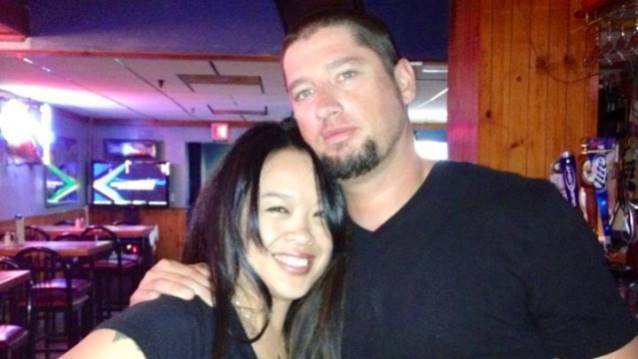 Two other people were killed in the Friday crash, including Bob's 40-year-old wife, Viengsavnh Bielarz (pictured with Bob), who was not wearing a life jacket, according to the Coast Guard. She died of drowning and multiple injuries and her death was ruled an accident. The cause of the collision remained under investigation. Greg Bielarz, Bob Bielarz's brother, told NBC 5 Chicago: "They go out boating every week, have fun. They know there's barges, they know the dangers, but things happen."